Every year for as long as I can remember my birthday (7th Jan) co-incided with some dreary back to work/school/college type date. It was always the first day back or the last day before "real life started again after the holidays. Still , this year its a bit better. 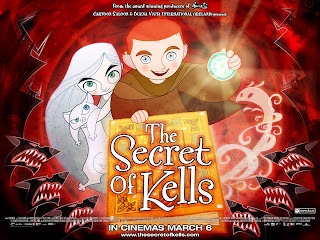 The first ever public screening of the Secret of Kells will take place in Forum des Images in Paris. Its at 3.00 pm , with an audience mainly of youngsters, I am told. I will be joined in the making of part by the screenwriter , Fabrice Ziolkowski and perhaps others. Not exactly sure yet of the running order etcetera but more news as I know it! Hooray. We stuck one up on the office wall. I will take a photo of it once its up in Kilkenny Cineplex. yesterday we had a very interesting screening at the office of the irish board of film classification. its a grand old building but we may be one of the last films screened there as it is being moved to a new office next year. we were pleased with the "pg" rating , despite the slightly scary or intense scenes, we feel its a film everyone can enjoy.
" an original work of art that also happens to be suitable for families and a young audience"
She plans to run trailers ahead of "Bolt" here in Ireland, which is great exposure to the best general audience we can hope for. Anyway today I am in Galway working on Song of the Sea, just gotta focus on the next one now....! 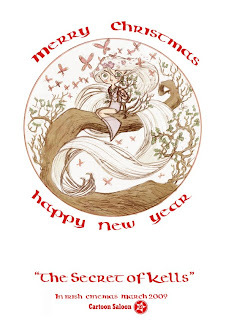 I made this sketch for the Aisling comic I am working on for the New Year. I am going to try something a little bit "Mucha" for this one. I got a big book of his stuff in Prague. Am in Cyech republic typing on very strange key board in very nice university building where we gave a presentation. Very christmassy buzz here with all the snow and son on. beautiful country. Ok off to see the Danish film Princess now. have been up since 4.30 this morning traveling to be here. vegetarian options are ,,,,,,as usual..... interesting! have learnt to swear fluently in czech. But the photo on the header does'nt really look like her that much. We had a screening for all the marketing people who will work on the film with Disney Ireland on Wednesday in the IFI. Some of the band memebers of Kila were there too as well as James Flynn the exec producer and some people from Trinity college and the Dublin Film festival. The "keeper of the book" Bernard Meehan was there too, I was sitting beside him and was nervous thru'out, afraid he would not like the liberties we took with the history to make this fantasy film, but thankfully he enjoyed it and was very enthusiastic. He (naturally) spotted all our references to mediaeval art and appreciated the research and homework we poured into it despite the fiction/fantasy nature of the story. It was a positive day overall, thanks to Trish fro making it happen. Today, Michael McGrath , voice of adult Brendan is doing the Voice Over for the Irish trailer. Here is the French theatrical trailer edited by Gebeka. I hope everyone in France will go to see this movie at least twice! hehe! as a link to a mini site as soon as its up and running.